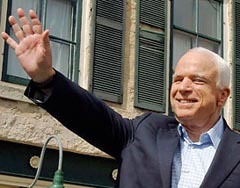 McCain played up his maverick image, said he&apos;s fought corruption, pork barrel spending and corruption in Washington, things he said have not always made him popular with his colleagues: “I was not elected Miss Congeniality in the United States Congress again this year.” McCain talked of his reputation as a fighter against pork barrel spending. “I&apos;ve fought the big spenders, I&apos;ve fought the pork barrelers . . . when I&apos;m president, the first earmarked, pork barrel bill that comes across my desk, I will veto it. You will know their names, we will make them famous, and we will stop this corruption,” he said to cheers from the crowd. The candidates remarks were greeted by cheers and chants of “U.S.A., U.S.A.” in Cedarburg , an affluent, mostly white community some twenty miles north of Milwaukee.